NEW YORK—Nestled between Park Slope and Carroll Gardens—two of Brooklyn’s most established, mature brownstone neighborhoods—Gowanus is a destination neighborhood in the middle of an economic and environmental transformation. It was formerly an industrial neighborhood with limited housing stock, with mainly just one- or two-story row houses spattered between warehouses and factories. Now Gowanus’s housing inventory is increasing and improving. Developers have been parceling land, getting zone variances to build higher, and starting construction on the largest residential projects the area has ever seen. The first game changer for many developers and property owners occurred in 2010, when the Gowanus Canal became a Superfund cleanup site. Another turning point came in 2013, when a Whole Foods store opened on Third Avenue. Developers, such as Lightstone and Adam America, have started new residential projects in the area—banking on cashing in on rising rents and property prices. At the same time, entrepreneurs have been steadily entering the neighborhood, bringing new concepts for restaurants, cafés, arts spaces, and activities. The result is that median residential rents in Gowanus have increased to around $3,240 a month, according to recent data compiled by Ideal Properties Group, a Brooklyn-based brokerage. The median rent in Park Slope is $2,800, according to Brownstoner. 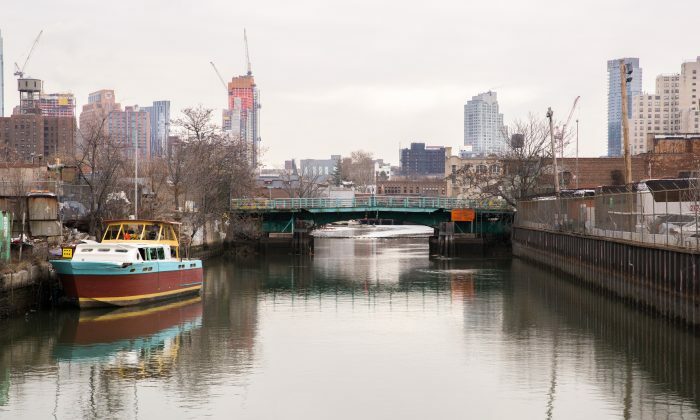 Median sales prices in Gowanus are up 20 percent year-on-year, hovering around $840,000, according to Ideal Properties’ data. But most surprising is that median asking prices in Gowanus are now over $1 million dollars, at $1.199 million. “So the question is whether this will be achieved,” said Ideal’s managing director Aleksandra Scepanovic, referring to the ballooning asking prices. According to census data analyzed by the New York City Economic Development Corporation, about a quarter of the population in Gowanus is between the ages of 25 and 34, and almost 15 percent of the residents are self-employed. If you want fine French cuisine, you shouldn’t go to Gowanus, according to Scepanovic from Ideal Properties. But Gowanus definitely has its own unique culinary scene and nightlife. A Dinosaur Bar-B-Que restaurant (1) moved into Gowanus in 2013. And Four and Twenty Blackbirds (2)—a high-end specialty pie store, which sells 10-inch pies for around $38 each—opened in Gowanus in 2010. The most recent addition to the neighborhood is Threes Brewing (3), a craft brewery, bar, and event space, which opened on Douglass Street in December. The brewery’s three founders all live in the area. They felt Gowanus was ideal for their concept because zoning permits manufacturing, and they “wanted to be part of the renaissance of a skill-based economy that’s taking place,” according to Joshua Stylman, a Threes Brewing co-founder and tech entrepreneur. Ample Hills Creamery (4) opened a storefront and consolidated its ice cream production facilities in Gowanus last summer. The company runs the ice cream store at Brooklyn Bridge Park during the summer and is preparing to open a store at Gotham West in Manhattan. The Whole Foods (5), which opened on Third Avenue and 3rd Street in Gowanus in 2013, “is a barometer of real estate,” according to Doug Bowen, a Brooklyn-based CORE broker. The store offers free parking with charging stations for electric cars. It attracts customers from many surrounding Brooklyn neighborhoods, and has its own café with seating. One of the priciest residential blocks in Gowanus is Carroll Street between the canal and Third Avenue. Why? Because Gowanus’s mini “restaurant row” is right there on Third Avenue—with The PINES (6), Littleneck (7), and the popular café Runner & Stone (8). It is also home to a number of properties owned by the founder of Tribeca Pediatrics, Michel Cohen. Several high-end condominiums are currently on the market on the south-facing side of this prime Carroll Street block. One is an approximately 3,330-square-foot former Ink & Brush factory located at 459 Carroll Street, with an asking price of $4.395 million—the priciest singe-family apartment on the market in Gowanus. A few doors west at 465 Carroll Street is a new four-unit boutique condominium, which went on the market in November. The building is four stories tall, with three two-bedroom duplexes (one listed at $1.249 million, and two listed at $1.549 million), and a one-bedroom apartment listed at $699,000. According to Douglas Elliman’s latest sales report, the entry threshold for luxury residential properties in Brooklyn—the top 10 percent of the market—was $1.4 million in Q4 2014. A quaint bridge over the canal on Carroll Street offers unobstructed views of the canal-side construction of Lightstone’s 700-unit, two-phase, rental complex at 363-365 Bond Street. The first phase of Lightstone’s project is slated for completion in early 2016 and will be built up to 12 stories. The project is on the site that the Toll Brothers abandoned in 2010, after the Superfund site designation. Entrepreneurs are bringing more and more unique arts and entertainment concepts to former manufacturing spaces in Gowanus. Gowanus now boasts a rock-climbing complex called Brooklyn Boulders (A), The Royal Palms Shuffleboard Club (B) (a 40,000-square-foot retro Miami-style space that serves cocktails in Mason jars), a Morbid Anatomy Museum (C), Gotham Archery (D,), Brooklyn Fencing Center (E), and a CrossFit gym. An indoor tennis center for kids is being planned for 524 Baltic Street. Gowanus has two performance venues that are open only during events: The Bell House (F) at 7th Street near Second Avenue, and Littlefield NYC at Degraw Street (G), between Third and Fourth avenues. Both are converted 1920s warehouses. Littlefield’s owners opted for a sustainable theme, with recycled rubber tires and cork used in their building materials, and the bar and tabletops built from salvaged bowling alley lanes. They are also planning to install a gray-water system and a landscaped roof. Littlefield holds a variety of events, including game shows like Punderdome 3000 (a pun competition), dance parties like Reggae Retro, and storytelling events like Mortified. Philanthropist Joshua Rechnitz purchased an abandoned powerhouse at 322 Third Avenue, about a block from Whole Foods, in 2012. The building is now slated to become an arts and education facility, and Rechnitz’s nonprofit has invested a great deal of money into cleaning up industrial contamination on the site. For performing artists and people who enjoy dance, The Gowanus Arts Building (H) on Douglass Street has rehearsal spaces that performers can rent and a larger area for performances. Gowanus Grove (I) has been a popular outdoor dance party spot on Sundays in summer, with a $10 cover charge. The parties ended last year because of Lightstone project’s more northerly building. Gowanus has a number of art spaces, galleries, and studio spaces for emerging artists to work in. Proteus Gowanus (J), founded by Sasha Chavchavadze in 2005, is one of the better-known galleries. 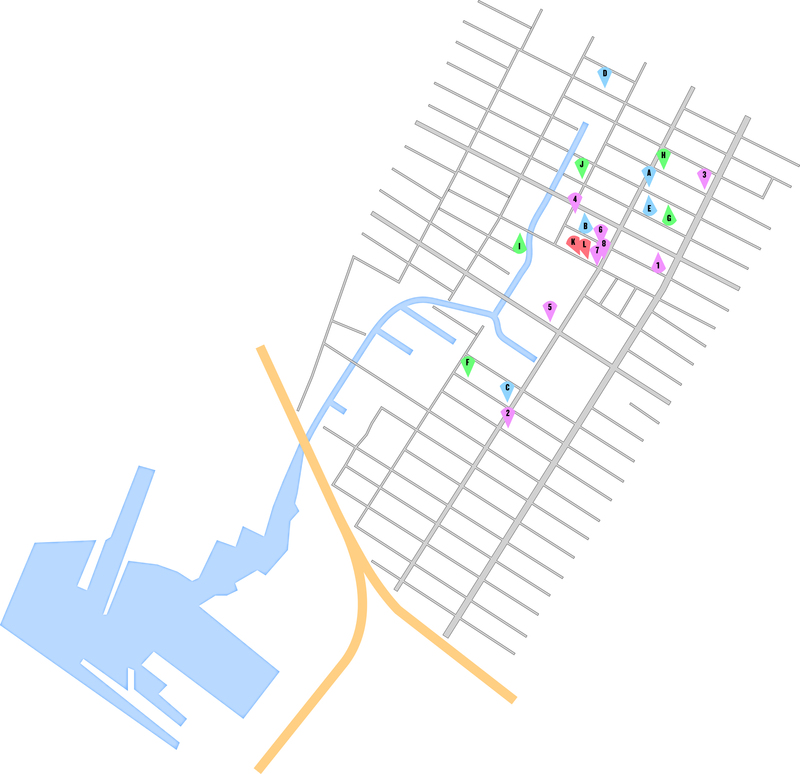 Gowanus is part of New York City School District 15, and elementary students who live in the neighborhood are zoned for two schools: PS 133 and PS 372. PS 372 has a mixed special needs and a general education population. Both schools also accept children from across District 15. Elementary-age children in Gowanus can attend the Brooklyn New School, PS 146, nearby in Carroll Gardens, which is open to pupils across the district. Middle schools in District 15 are by choice, and the highly desirable William Alexander, MS 51, in Park Slope takes only high-scoring pupils. The heart of Gowanus is accessible from the Union Street stop on the R train line, just one stop from the Atlantic Avenue/Barclays Center station. Gowanus’s proximity to the Queens Brooklyn Expressway (Interstate 278) makes for an easy drive to Manhattan, Queens, and other parts of Brooklyn. Battery Park City is as little as 15 minutes away via the Hugh Carey Tunnel, which has a toll. If highways are congested in Brooklyn, Fourth and Third avenues often offer an efficient detour. Both of these avenues run through Gowanus. A controversial new parole facility at 15 Second Avenue in Gowanus is opening sometime this month, but a spokeswoman for the Department of Corrections and Community Supervision (DOCCS) said they still don’t have a firm date. The facility was initially going to be a “mega-site,” amalgamating the services of three Brooklyn parole centers into Gowanus, as leases expired on the buildings housing the other sites. But community protests and legal action led to an agreement: The number of parolees visiting the site will be capped at a maximum of 2,000 for the first two years—it was originally going to serve 6,000 parolees. “When the time period ends, there will be additional discussions with the community,” Linda Foglia, a spokeswoman for DOCCS said. Creative companies are seeking space at the Brooklyn Navy Yard (BNY) faster than it can be developed. Around 2,300 of the city’s most prominent real estate industry movers and shakers attended the 119th Annual REBNY Cocktail Party and Banquet on Thursday, January 15, 2015.